A free half-day workshop about Single Handed Care will take place at Bootle Town Hall on Tuesday, 5 February. 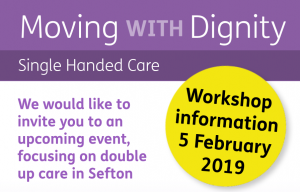 This is a chance to find out more about Moving with Dignity, the Single Handed Care approach and how it fits in to the national approach to Care Provision. The introduction of Single Handed Care will mean that there is a potential for new care packages for those who are currently in receipt of double up care. This comes as developments in moving and handling indicate that in many cases a single care worker can provide care safely on their own. In areas where Single Handed Care has been introduced, service users feel that they have more independence, a better relationship with their care worker and more dignity and privacy. In some cases, the new approach will allow people to have the choice to be cared for safely by a relative for longer. The workshop will provide caregivers and other healthcare professionals with the opportunity to gain practical experience of the type of tasks and equipment that will be used to perform Single Handed Care. The session will ensure that attendees are updated on what care professionals and service users can expect from Single Handed Care and work towards achieving successful outcomes for care workers, service users and Sefton Council. To apply for a session, either morning (starting at 9am), or afternoon (starting at 12:45pm) please email admin.ots@sefton.gov.uk stating which session. Cllr Paul Cummins, Sefton Council’s Cabinet Member for Adult Social Care, said: “The introduction of Single Handed Care has the potential to provide service users with more independence, dignity and privacy, allowing them to live the lives they’d like to live for longer. Do you know your rubbish responsibilities? Bootle-based Regenerus hosts Tomorrows Land- and you're invited!